Donate Money – Monetary donations are the #1 most helpful! If you can share your financial resources, make a financial donation and allow us to use those funds to purchase food and other provisions for those in need in our community. You can provide your donation to any of our board members, drop it by the office in Bulverde, or mail it to us. Or, you can make an immediate donation by clicking on the “Donate” button on the home page of this website. Each $1 donated equals $7 in purchasing power through our partner The San Antonio Food Bank. Donate Food & Toiletries – If you have food or toiletries that you would like to donate, we’d be happy to take what you have and distribute it to those in need. Food and toiletries items can be dropped off at our warehouse in downtown Bulverde at 2295-1 Bulverde Road (behind Wine 101) during our hours of operation. Please, we ask that you do not leave any donations on our doorstep when we are closed. Food donations that are left unattended at our door are subject to the elements and may also attract pests. Any food that is left when we are closed will have to be discarded–and you know that we do NOT like to waste food, so we ask that you abide by this simple guideline. If you have a donation but cannot get to us during our normal hours of operation, please call us to make arrangements for someone to be here to receive your donated items. Please note that we do not accept donations of clothing, household items, or other soft goods. We encourage donors to take those items to our sister organization, the Bulverde Thrift Store. Host a Food Drive – If you have a location you believe would be great for a food drive, let us know by calling us or clicking on the Contact Us button. We can help you get started! Sponsor an Event – If you would like visibility for your organization, sponsor an event hosted by Provisions. Whether you sponsor an event like our annual Holiday Hunger Run/Walk 5K or host an event of your own as a benefit for Provisions (such as a chili cook off, raffle, or concert), we’d love to work with you to help raise awareness and bring the community together to help those in need. Volunteer Time – If you would like to provide your time and/or talent to Provisions, we’d love to have you. Like all non-profit organizations, we survive because of the generosity of so many people who give of their time and talent, and we can certainly use you for our annual events and weekly needs. 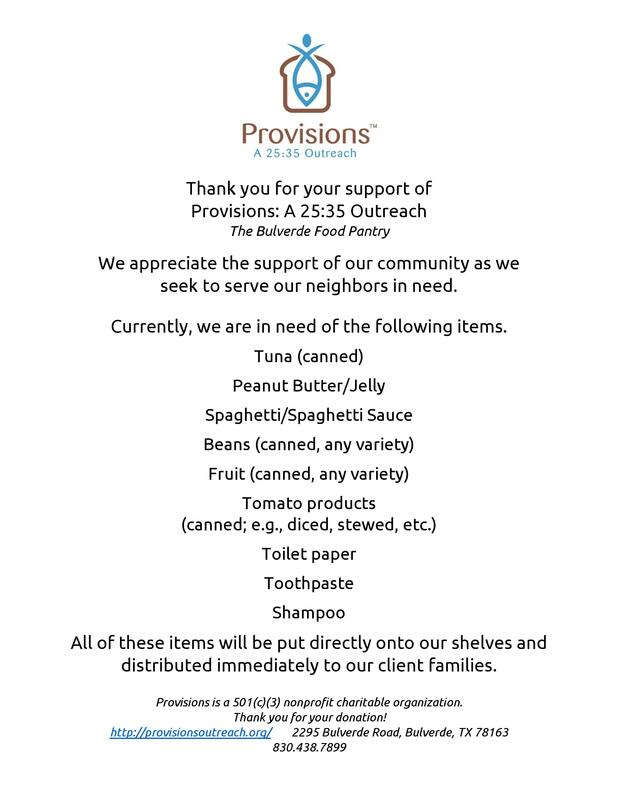 Please visit the Volunteering at Provisions page by clicking HERE. Donate an item that we can raffle to raise funds. (Television, Computer, Vehicle, Vacation Package, Cruise, SPURS tickets, etc.). 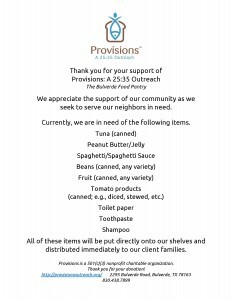 Like our Facebook page at https://www.facebook.com/provisions.outreach. Then share it with all your friends, family, neighbors, and acquaintances. Pray for the Cause – If you feel led to support our efforts through prayer, we’d welcome your prayers. Pray that God blesses our efforts to care for the needy in our community. We learn in Philippians 4:6: “Do not be anxious about anything, but in every situation, by prayer and petition, with thanksgiving, present your requests to God.” We are presenting our requests to God that He blesses our efforts, and we’d love for you to join with us in prayer. Donate and Shop at the Bulverde Thrift Store – The Bulverde Thrift Store is our sister organization and helps support our cause. If you have items to donate or simply want to shop for bargains, the thrift store is located at 20475 Hwy 46 W., Suite 220, Spring Branch, TX 78070. (In the Bealls shopping plaza). Shop Amazon Smile – When shopping online using Amazon, please enter Amazon using the Amazon Smile portal and designate the Provisions: A 25:35 Outreach as your charity of choice. After selecting us as your charity, you shop as usual on the same great Amazon, but a percentage of your purchase is donated to us! Can’t get any easier than that! Join iGive – this free shopping site has 1574 big name stores (Target, Best Buy, Amazon, HP, PetsSmart, etc.) www.iGive.com/provisionsoutreach You shop as normal and the stores provide a rebate to your account, then the rebate donations become tax deductible donations to Provisions. It does not cost you anything other than remembering to login to the iGive.com site first and then start shopping. These donations help us stay operational so we can continue to serve those in need. A good many of the stores offer discount coupons for a benefit to you.